The Shanwick FIR (EGGX) and Gander Oceanic FIR (CZQX) cover the airspace above the North Atlantic, from 44° North to 61° North and partly up to 64° North (only in Gander FIR). This airspace is moderately hostile to civil aircraft, as there are virtually no land-based navigational aids or communication relays. The Shanwick FIR covers the airspace from the coasts of Europe to 30° W. The airspace is class A from FL55 to FL660, (below FL55 is a class G airspace within the OCA, NOTA, SOTA and BOTA). The Gander Oceanic FIR covers the airspace from 30° W to the coasts of Newfoundland and Labrador. The airspace is class A from FL55 to FL660 (except the area over southern Greenland is a class A airspace from FL195 to FL660). Traffic within the Shanwick FIR is managed by the Shanwick Oceanic Control Centre located in Prestwick, Scotland. The name of the FIR is actually a combination of Shannon and Prestwick -> Shan-wick. Communication to pilots over the North Atlantic is made via Shanwick Radio which is located in Shannon, Ireland. 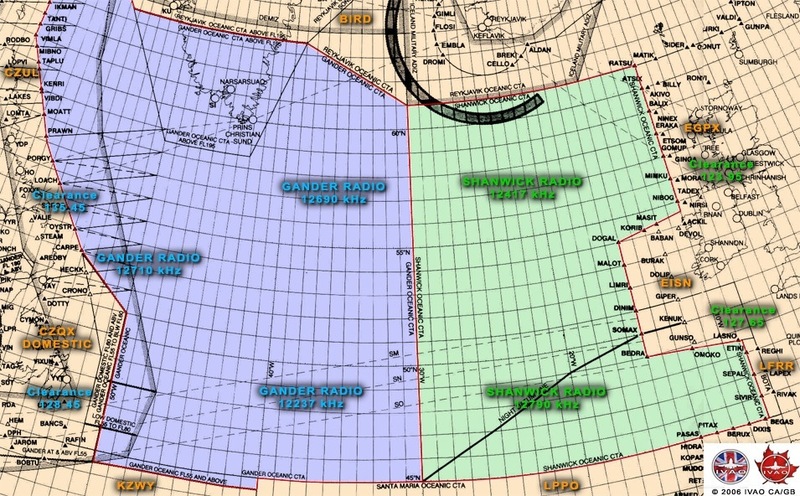 Traffic within the Gander Oceanic FIR is managed by the Gander Oceanic Control Centre, which is a non-radar unit of the Gander ACC. Communication to pilots over the North Atlantic is made via Gander Radio. A detailed map of all Oceanic FIRs is available here. All ATC is provided via position reporting only, as there is no radar available over the Atlantic. Furthermore all airspace between FL285 and FL420 is designated MNPS (Minimum Navigation Performance Specifications) airspace. Basically, this imposes far more rigorous navigation limitations on aircraft and imposes the use of pre-defined North Atlantic Tracks (NATs) as opposed to random tracks (here). Because of the vast distances to be covered, the lack of navigational aids and the weather conditions over the North Atlantic, a system of daily tracks exists. North Atlantic Tracks: dynamic airways which change location and direction twice daily to facilitate traffic flow across the North Atlantic. For more information refer to the Pilot Procedures page. In the real world you will find most flights from America to Europe (Eastbound) will take place during the night, whilst Europe to America (westbound) tends to occur during the day. On IVAO, flights in both directions are permitted at all times and the semi-circular rule is applied. All pilots are urged to consult the current tracks to plan their route across the Atlantic. The current NATs are available here. NATs are only within MNPS airspace. Aircraft flying above or below this airspace must file a random route. The hours of validity are specified in the track message. The most northerly track of a day OTS is designated as NAT Alpha; the adjacent track to the south as NAT Bravo; etc. For the night OTS, the most southerly track is designated as NAT Zulu; the adjacent track to the north as NAT Yankee; etc. Flight levels are allocated for use within the OTS and in most cases, details of domestic entry and exit routings associated with individual tracks are provided in the NAT Message. Random tracks are basically handmade routes across the North Atlantic, using Lat/Lon waypoints, just like the NATs. Random tracks are used for routes where the NATs are not suitable, such as flights from eastern Canada/USA, to the Scandinavian countries, or southern Europe, who will most probably not transit via the Shannon (EINN), Scottish (EGPX), London (EGTT) or Brest (LFRR) Flight Information Regions. However random tracks which cross through, or come within 120 miles of the NATs, will not be accepted. Aircraft flying these routes are expected to file a NAT.